Goat Cheese Truffles - A recipe from Savor California, the online showcase for extraordinary gourmet foods and beverages from California. Rachel Riggs is the creator of this recipe and the owner of Quel Fromage *. She also provided the photo. Melt chocolate in a double boiler, stirring until smooth. Cool slightly. In a bowl whisk together the Fromage Blanc, confectioner's sugar, vanilla and lemon zest. Whisk in the chocolate until well combined. Cover and chill the mixture until firm. 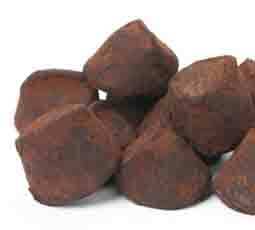 Form into balls and roll the balls in the cocoa powder. Chill on parchment until firm.